What can we learn about the city's growth through its cartography? ​I'm a map dork. If that isn't clear by now, look at the maps I've made of Almaty alleikas, ear graffiti, and mosaics, or check out the map that really motivates this whole project: the progress map that shows the streets in Almaty I've walked so far. The more I've added those red trails to the map with my footsteps, the more I've discovered new districts, explored new frontiers, and found that the map of Almaty is one that doesn't stay stable for long. Just last year the city swallowed two dozen villages and added a whole new borough! This impressive growth, I realized, is something that I could comprehend by harnessing my passion for cartography, looking at historic maps and tracking how the city's shape has changed from one era to the next. 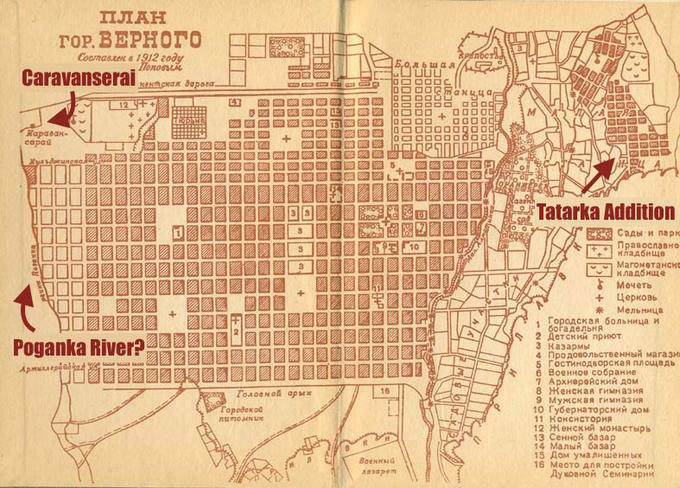 ​To do this, I found thirteen historic maps of Almaty online and used my knowledge of the city's geography to pinpoint what exactly was changing from one year to the next. Some of the maps were meagerly labeled, so I used a cool trick: I uploaded them as image overlays to Google Earth and played with their transparency, so that I could line up the old maps with the new. What a revelation that was! With the pale outline of a 19th century map hovering over a modern satellite image, I could see the historic roots of the city's grid, the core that existed before the sprawl. 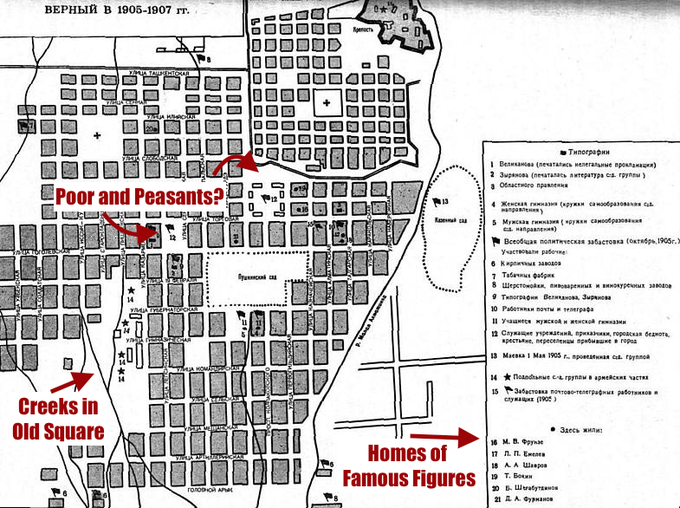 ​The oldest maps I could find were not old, per se, but mostly Soviet-era reconstructions of former city plans. 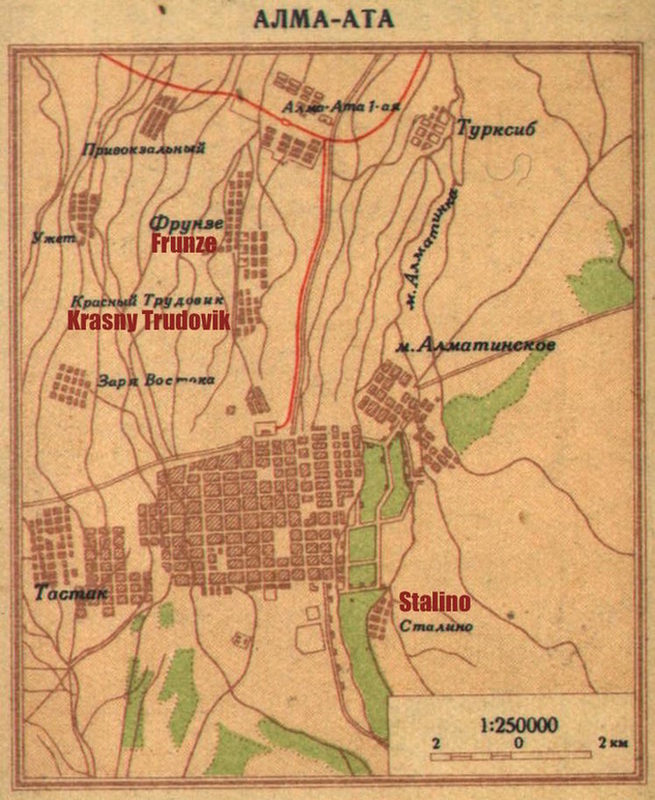 Let's start with this first map below, showing Almaty's humble beginnings as a border fortification and cossack village in the Russian Empire. Almaty started as a fortress on the edge of the Russian Empire called Verny [Верный], which means "Faithful" in Russian. Esik and Kaskelen, modern-day suburbs of Almaty, were called Nadezhdinskaya [Надеждинская] and Lyubavinskaya [Любавинская] respectively, meaning "Hope" and "Love." Yes, there's a theme here! These new outposts of empire, Faith(ful), Hope, and Love, were named after the three theological virtues listed in Corinthians 13:13. Another suburb called Talgar, by the way, was originally Sofiskaya [Софийская], after Sofiya, the god of Wisdom, and Wisdom was considered the "mother" of virtue. These cities were all renamed during the Soviet period, but the clever naming scheme remains hidden in the history books. Next to the fortress soon arose Almaty's first neighborhood, a "stanitsa" or Cossack village which would eventually be called, simply enough, Big Stanitsa [Bolshaya Stanitsa; Большая Станица]. The Cossacks were a warrior caste from southern Russia who were sent to push the empire forward and man the forts, and stanitsas followed where ever they went (Nadezhdinskaya, Lyubavinskaya, and Sofiskaya were also originally stanitsas). In the first of our maps, you can see Bolshaya Stanitsa as the gridded street plan, and the Verny fortress as the jagged star in the northeast, across the Malaya Almatinka river from the settlement. There are a few things I'd like to note about the map. First, look at all those rivers! These are rarely drawn in, but they give you an idea of what a water-full world the region was. The greater province, after all, was called Semirechye, or "Seven Rivers," after the numerous channels that flow into Lake Balkhash. Next, notice the border around the city grid. This would appear to suggest that the fortress walls were originally planned to surround the stanitsa too, but I've never read anywhere else about the walls going that far, so this must have been an aspiration later foregone. 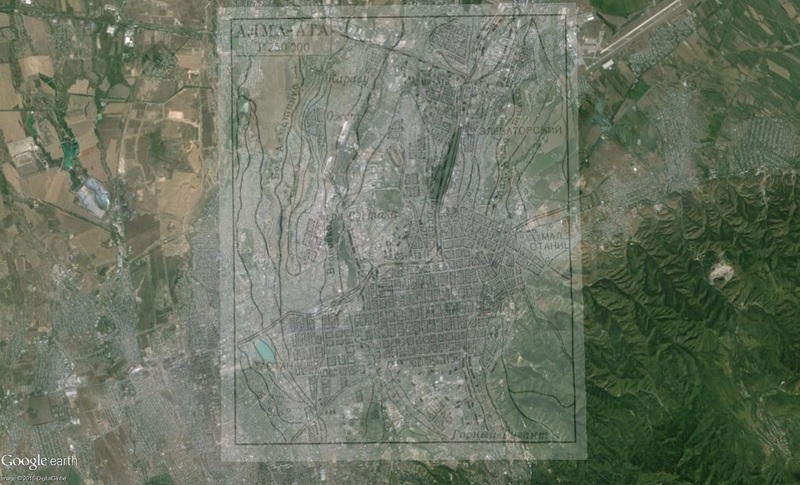 Last, about that grid - you can still see it on Almaty's map today! If you look at the neighborhood northeast of the famous Green Bazaar, you'll see that the blocks become shorter and the streets more numerous - this is the original neighborhood Bolshaya Stanitsa. At the center, just as in the old maps, still stands Sofiya Cathedral, though few people know that Almaty's oldest neighborhood, and its historic church, are just a ten minute walk from the city's most popular tourist attraction. ​"Plan of Verny in the 1860s"
We next move along from the original plans for the fortress and stanitsa in the 1850s to the city's layout in the 1860s. The fort is now shown as more globular than star-like, but Bolshaya Stanitsa is still there, and to the northeast it has been joined by a newer neighborhood, Malaya Stanitsa [Малая Станица], which translates as "Small Stanitsa." While "Bolshaya Stanitsa" hasn't really stuck around as a name in the people's consciousness, Malaya Stanitsa can still be found today. It's not labelled on any maps (except mine), but most Almatians still know it, and you can find it by going down Tatibekova Street until the bus stop called "Ekran." Just like Bolshaya Stanitsa had its central Sofiya Cathedral, Malaya Stanitsa was arranged around its Kazan Cathedral, and you can see the square on the map where the church still stands today. Below Malay Stanitsa, the big skewed village in the northeast, you'll also see one more neighborhood has been added - Tatarskaya Sloboda, now known affectionately as Tatarka. Located at the confluence of the creeks Kazachka and Solonovka, Tatarka was originally a small settlement of Tatars, Muslims from Russia speaking a Turkic language similar to Kazakh. Tatars came from throughout the empire to provide goods and services to the Cossack soldiers in the stanitsas, and in modern-day Tatarka you can still find streets named after the places where they came from: Ufa Street, Kazan Street, and Crimea Street, for example. With this map, a few things popped out. First, under the label for Malaya Stanitsa, the name "Balabaevka" is found in parentheses. I've never seen this toponym anywhere else, and have no clue where it came from. I was also surprised to see a square kladbische [кладбище], or cemetery, between the districts of Bolshaya Stanitsa and Tatarka, as I've never heard of such a place. 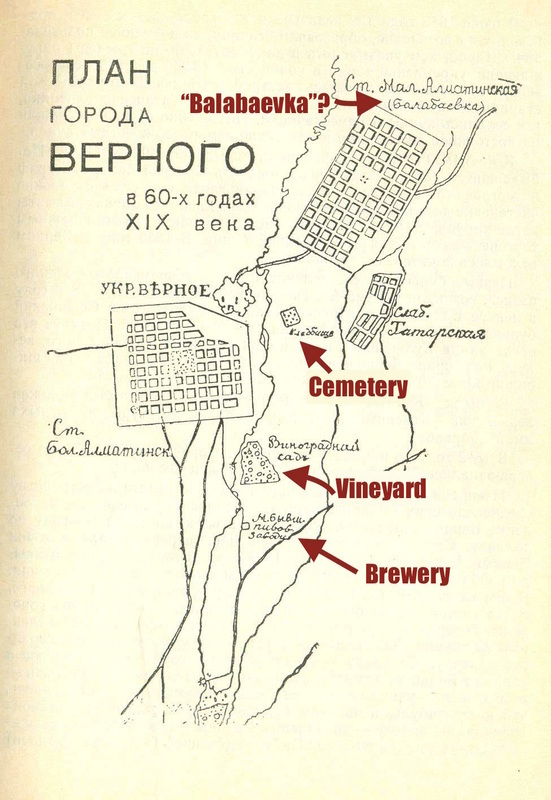 The other two labelled items on the map, by the way, are the vineyard and beer factory, so I guess that gives us a hint about what those Cossacks liked to do in their free time! "Plan of the City of Verny, 1879"
Our next map shows us the official city plans from 1879. The image of the pedestal at the bottom-right of the map reads "Head of the Mayor's Surveying Department Larionov," commemorating the official who helped draft the new grid. We can still see Bolshaya Stanitsa, Malaya Stanitsa, and Tatarskaya Sloboda, but now the city has greatly expanded to the southwest (a directional trend that continues to this day, interestingly enough). According to the legend of the map, the stanitsas are colored yellow because the buildings there were made of wood, while the rest of the blocks are painted pink because the buildings there were made of stone. This may have some relevance to the earthquake, which happened that same year in 1879 and destroyed many brick buildings. The black bits apparently represent sites of industry, such as "Kuznetsov's Vodka Factory"...again with the booze-making! One part of the map that I haven't quite figured out is the long westernly extension of Torgovaya Street, or what is now Zhibek Zholy Street. Here it can be seen continuing even beyond the river Vesnovka, which is strange, because for a long time that was precisely the western frontier of the city. What's behind this little panhandle? I have yet to find out. "Verny in the Years 1905-1907"
Unlike the last map which showed the city as a rather hemmed-in grid, this map of Verny from 1905-1907 shows the western edge of the city to be a bit less developed than dictated in the city plan. We can even see a creek running through what is now called the Old Square, where military barracks stood at that time. A couple of flag icons, marked with the number 12 and found in city squares, are said to show "shop assistants, the city poor, peasants, settlers." Were these some kinds of shantytowns, or what? In any case, this map seems to be just a snippet of a larger map - the points of interest marked 16-21 show where famous military figures like Mikhail Frunze and Bagautdin Shagabutdinov lived, but D.A. Furmanov's home, number 21, is somewhere off the map. In this snapshot of Verny from 1910, we finally get to see close-up, and indeed recognize, some of the city sites we know today. Panfilov Park is there (then named Pushkin Gardens), with a cross marking its Voznesensky Cathedral, as is Nikolsky Cathedral, but the biggest surprise of continuity has to be the prison northwest of the grid, exactly where a prison stands today on Seifullina and Mametova! 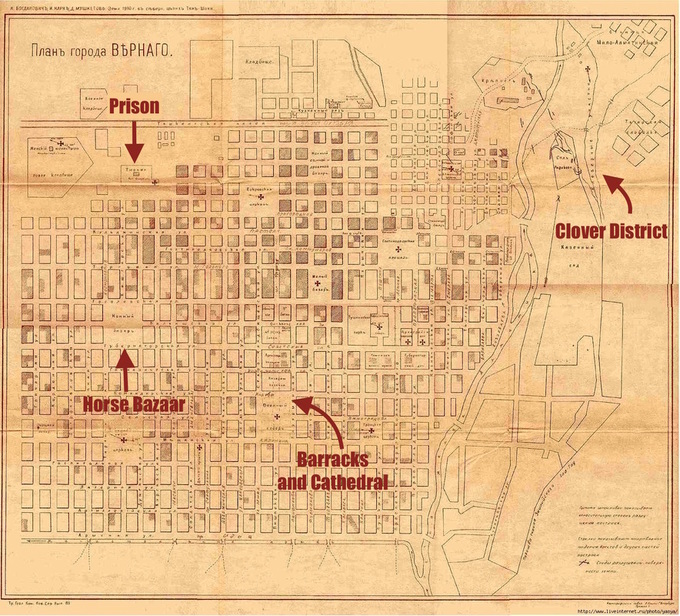 Elsewhere, we can see what used to be, like the neighborhood called Klevernye Uchastki [Клеверные Участки], or "Clover District", where the zoo now stands; the horse bazaar at the site of today's tram depot, or the barracks area [казарменная площадь; kazarmennaya ploschad] where the Old Square can be found now. 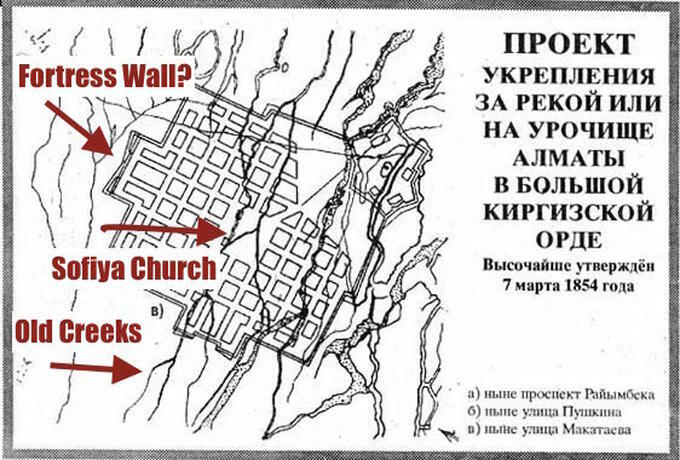 Before I read this map, I never knew that there used to be a church in that central square, called the "Military Cathedral." Turns out it was built in 1906 at the modern-day site of the Zhurgenov Arts Academy, and destroyed in 1931 because of anti-religious sentiment. 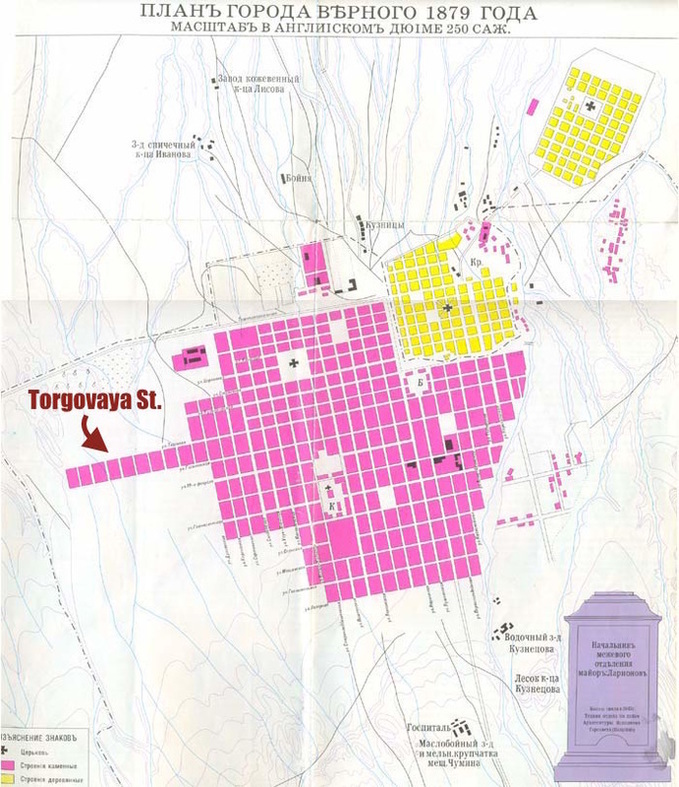 The general plan from 1912 shows the city still contained by Tashkentskaya Street to the north, the Malaya Almatinka river to the east, and the main aryk to the south, but it has expanded west to the river Vesnovka, which is marked here, oddly, as the Poganka. Whereas the Tatarka neighborhood was marked on previous maps as a small sliver entirely west of Solonovka Creek, here it has grown to include a new southeasternly addendum, and, oddly again, it has been mislabeled as Malaya Stanitsa. What was most curious to me, however, was the label in the very northwest corner of the map - it says "Caravanserai"! It lies right along the road to Tashkent, but I wonder what exactly a caravanserai provided in 1912, centuries after the Silk Road. This map, our last map from the Verny period, seems to use the same data as the 1905-1907 map we saw earlier, but it's got some nice colors and a few additions. Just like in past maps, one is struck by the amount of creeks, now long gone, that ran through the city. Each one here has been labeled арыкъ, or aryk, the local word for small channels of water. The only rivers that have been labelled with proper names are the Malaya Almatinka, a constant presence to the east of town, and one even farther east of that labelled Meschansky Aryk [мѣщанскій арыкь]. Meschansky, which apparently refers to a social class of merchants in the Russian empire called meschane, may have inspired the name of a nearby street Meschanskaya (now Kabanbai Batyr). Anyways, this neighborhood with Meschansky Aryk and Meschanskaya Street is the long green plot in the east. On the other maps we've seen it's been marked sadovye uchastki [садовые участки] , or "garden neighborhood", and in modern-day Almaty, you can still find a quaint neighborhood there called Kompot. And now we zoom into the bright socialist future! Welcome to the USSR. The Russian Imperial city of Verny has been renamed Alma-Ata, and since 1929 it has become the capital of the Kazakh Soviet Socialist Republic. It's not just the city that's been renamed, either. The barracks district we saw earlier is now Red Square [Красная Площадь; Krasnaya Ploschad], the space around Nikolsky Cathedral is now Proletariat Square [Пролетарскаыа Площадь; Proletarskaya Ploschad], and even the prison is no longer a prison, but a "House of Correctional Labor" [Исправиетльный трудовой дом; ispravitelny trudovoi dom] - apparently the old word for prison, tyurma [тюрма], was too strongly associated with the tyranny of the imperial state. Though the city's borders have stayed the same through the turmoil of the civil war and early years of the Soviet Union, the map is full of interesting new details. What caught my eye most of all were all the cemeteries, which weren't marked well on previous maps. 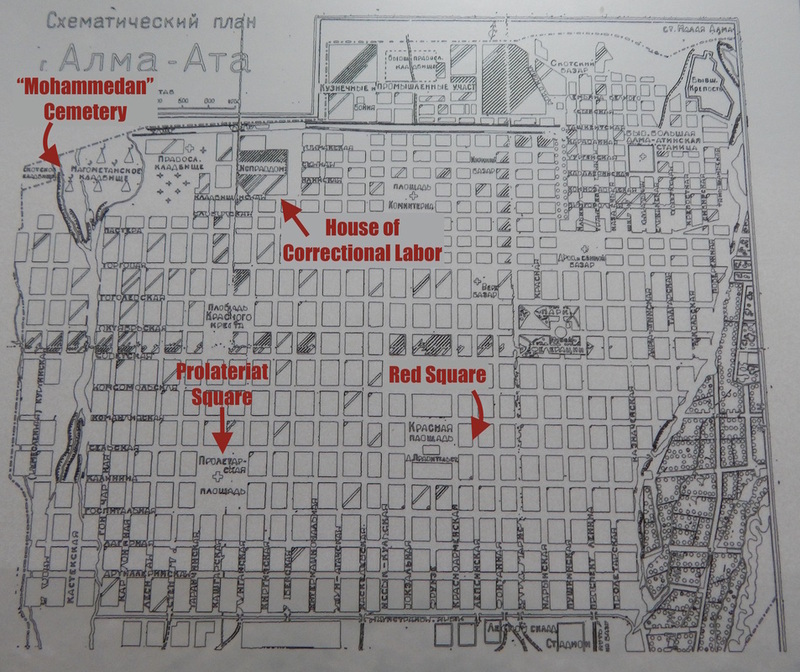 It was only from this map, for example, that I learned there was once a "Mohammedan" ceremony in the marshy northern reaches of the Vesnovka river, and that the street leading there was even called "Cemetery Street." You can also find a cemetery at the modern site of the Almaty-2 Train Station, built a few years later in 1939. 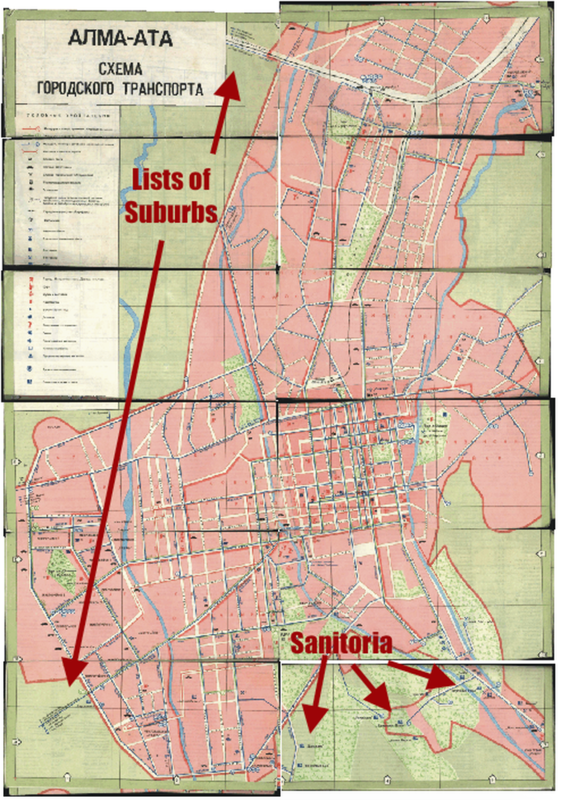 This map from 1937 is the first to show the city's administrative divisions, or raiony [районы]. With names like Lenin District, Stalin District, and Frunze District, the exact territorial units featured in the map are a thing of the past, but their predecessors live on, with eight modern-day raiony: Medeusky, Almalinsky, Bostandyksky, Auezovsky, Alatausky, Zhetisuisky, Turksibsky, and the newest, announced just this year, Nauryzbaisky. With all the tumult of the Russian civil war and the radical years that followed, the city hasn't had much time to change shape since the Verny-era maps we've looked at. There appears to be only one small addition to the city's overall profile, and that's a neighborhood, seen in the northeast corner of the map, that's popped up besides Malaya Stanitsa and Tatarka. This district is distinct to this very day, separated from the others by the Eastern Ring Road, and some locals know it as Turkchatnik [Туркчатник], named for its population of migrant Turks from the Caucasus. Only an Atlas of the World from the Soviet Union would ever have a special page devoted to a town as small as Alma-Ata, but we should be grateful that this 1940 edition gave the city such a nice treatment, because the map allows us a rare glimpse at the city and its environs in the era right before it boomed and sprawled. The satellite villages here have all since been swallowed by the Almatian metropolis, but there are many familiar names that have remained. Tastak [Тастак], in the southeast, was once a stanitsa, here a collective farm, and has since expanded to become a well-known nine-story suburb of the city. Above that is Zarya Vostoka [Заря Востока; "Dawn of the East"], which is today a neighborhood known for its Uyghurs, west of the infamous Barakholka bazaar. Then, above that is Uzhet [Ужет], which is now more properly rendered in Kazakh as Özhet [Өжет] and is a village that remains on the city's periphery to this day. Many of the other toponyms here, however, are a mystery. What is the little town in the southeast, marked Stalino [Сталино], after you-know-who? I can't find it in any historical records, though it corresponds roughly in location to the modern-day neighborhood of Kök-Tobe 2 [Кок-Тобе 2]. 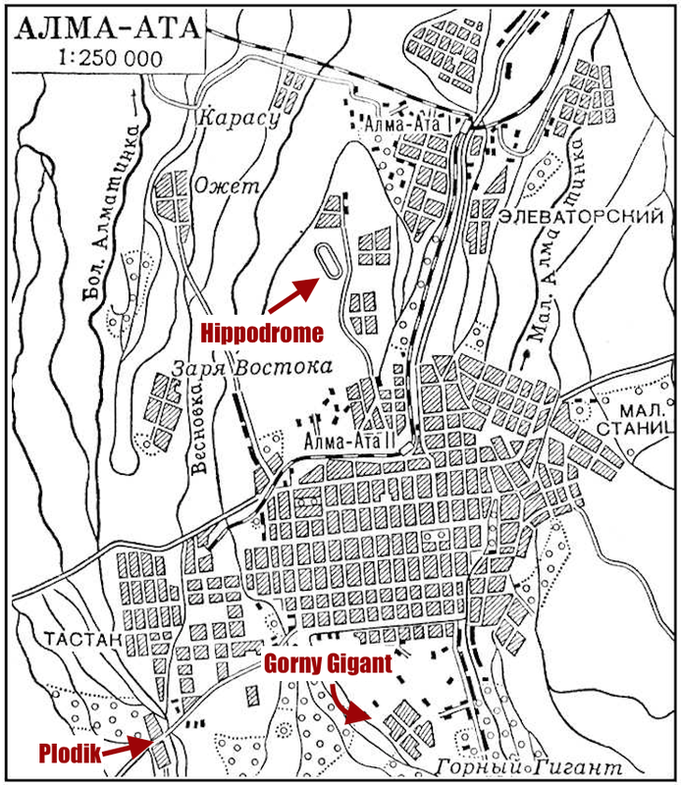 What are the villages (most likely collective farms) found west of the red railroad line, between the city and the Almaty-1 train station? No such neighborhoods as Frunze [Фрунзе; named after Mikhail Frunze] or Krasny Trudovik [Красный Трудовик; "Red Worker"] exist there now, and I've never heard of them elsewhere. There was indeed a town called Krasny Trudovik, now called Trudovik, but it's farther northwest, on the city's contemporary fringe. What I suspect is that some of these place names were brief, apparat-level distinctions, collective farms organized under a certain Communist-sounding name for a period, before being reorganized into something else and soon forgotten. A case in point: Malaya Stanitsa, the onetime Cossack village that we met before, was rebranded as Luch Vostoka [Луч Востока; "Light of the East"] for a time during the middle of the last century, but the moniker always rang false to locals, and it has since disappeared from casual use. Incidentally, Malaya Stanitsa is marked, on this map, as Maloye Almatinskoe, which is not a twist on the name I had ever seen either. Studying toponyms in this part of the world sure can get messy! This map was dated by the source to 1969, but I remain skeptical - you can see that not much has changed since the last map from 1940, yet I know that Almaty actually underwent a tremendous transformation during those years of Khrushchev. There are a few differences between the maps that I can sniff out, however. For one, if you look north of the city center, you can spot the shape of a racetrack - that's the Almaty Hippodrome. The neighborhood of Gorny Gigant [Горный Гигант] has emerged to the south, where it remains to this day, famous for Uzbek noodle joints. Running southwest out of the city we see Zhandosov Street, which was once just a highway running out to Kamenka, and towards the corner of the map along Zhandosov two new blocks have appeared: this is the neighborhood of Plodik, built up around a canning factory. 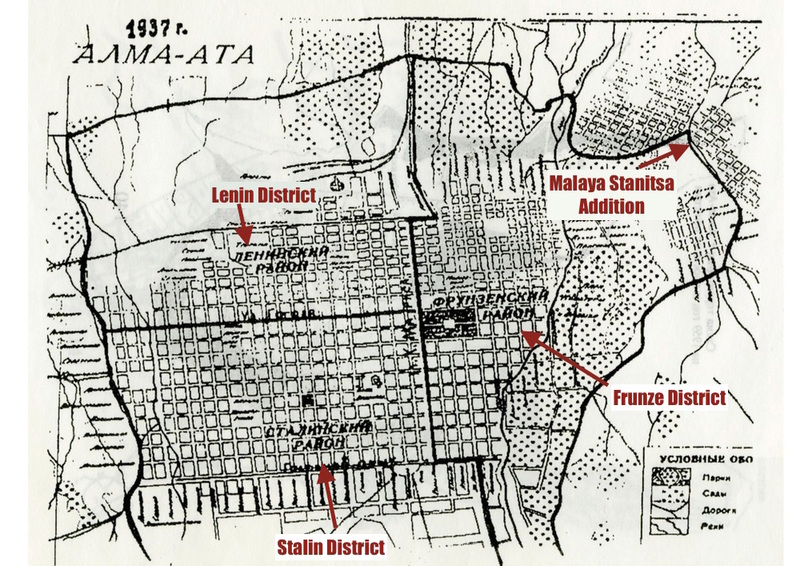 ​"Alma-Ata, 1978, with Public Transportation Routes"
Wow - the city just got three times bigger! In 1956 Almaty had what I call the Khrushchev Pivot, when the new leader of the USSR announced that, in order to solve the housing crisis at the time, all construction should be shifted to pre-fabricated concrete elements. Something called the "Almaty Homebuilding Factory" soon went up, and huge blocks of apartment buildings started to sprawl to the west of the city, where planners decided that the risk of earthquakes was least acute. Then came what I call the Kunaev Boom, after Dinmukhamed Kunaev, the leader of Soviet Kazakhstan from 1964-1986. It's no accident that Kunaev's term coincided perfectly with the term of Leonid Brezhnev, Khrushchev's successor, as the two were close colleagues. Brezhnev himself once served as the head of the Kazakh Communist Party, and when Kunaev's ally made it to the Kremlin, Kunaev used his influence to flush Almaty with funds for grand projects and growth. The city grew more during the Kunaev Boom that at any other time in history. ​Part of this boom was the creation of the so-called microdistricts [микрорайоны; mikroraiony], self-contained communities of pre-fab apartment blocks that sprouted so fast that most of the new neighborhoods never got names. In the west of the city, you could now find Microdistrict 1, Microdistrict 2, and so on, all the way up to 12. Other microdistricts got patriotic names like Orbita [Орбита; "Orbit"], an ode to Kazakhstan's Baikonur cosmodrome. On this map, a couple of these microdistricts stood out to me. First of all, I noticed something labelled "Microdistricts A and B" in the northeast corner of the map, but I had never heard of such a thing. It turns out that these were just placeholder name for the microdistricts that stand there now, Altai and Zhuldyz. I was also surprised to see the microdistrict Dorozhnik all alone in the northwest, without its current twin, Ainabulak. It turns out that Ainabulak was built later, and for a few years Dorozhnik had the only apartment buildings for kilometers around. I was also surprised by all the parks (marked on the map with fluffy trees) that once existed and have now disappeared. For example, Almaty still has its Botanical Gardens, but who knew that they once extended north of Timiryazeva, running up the side of Baizakova? This area was later developed into the microdistrict Köktem. There are also green wedges where the neighborhoods of Microdistrict 12 and Samal 2 now stand, in the west and east of the city. But strangest of all for me is the triangle of greenery found on the map in the upper reaches of the orange-colored Lenin District. 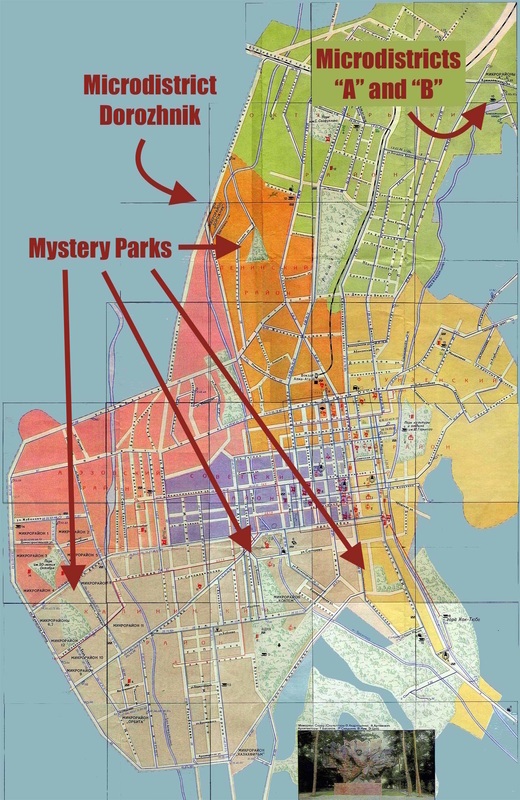 That was always a very industrial district, and I've never heard of any verdant oasis out there, yet I've seen a couple maps now with this park, and the street nearby even used to be called "Rose Street." Does anybody know what this was? "Alma-Ata. Map of Public Transportation"
Here is our final map, and it's quite a fun one. I found it on this site, and it's a huge file, split up into digestible portions (hence the slices in the image above). I can't find any reference to the year it was printed, but I suspect some time before 1983, because the microdistricts of Almagul and Ainabulak hadn't been built yet. This certainly isn't the end of Almaty's cartographic journey, but we have to end somewhere, and by the time we get to more recent maps, everything is so familiar that the treasure hunting isn't as much of a thrill. I'm especially interested in Almaty's periphery, so it was a joy to discover that at the edges of the map, where the highways run across the borders of the city, the cartographer has provided a list of all the places that road might take you. So if we were to keep driving southeast, for example, we might end up in Krasny Vostok [Красный Восток; "Red East"], which is now called Akzhar [Акжар], or higher up in the mountains in Kooptekhnikum [Кооптехникум], which is now called Kargaly. I also enjoyed seeing the various health resorts, or sanitoria, marked in the foothills of the city. I've been to some like Ak Kaiyin and Kok Tobe, but I guess I never realized how many there were. This is another post that would be fun to do some day, looking at the various forgotten spas in the hills here - many of them still offer "koumiss therapy", a health treatment based on mare's milk that was once all the rage in the Soviet Union. 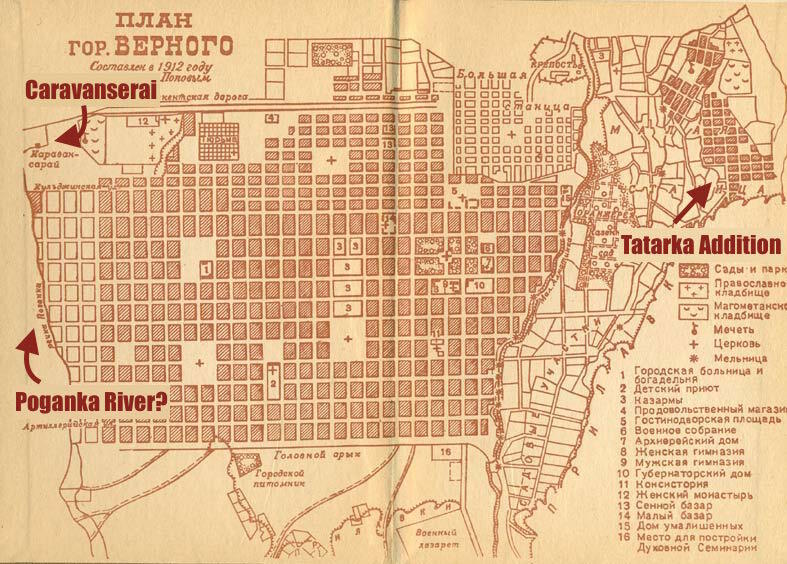 Until then, I hope you've enjoyed this little journey through the history of Almaty's maps. Let me know if you spot anything else of interest!